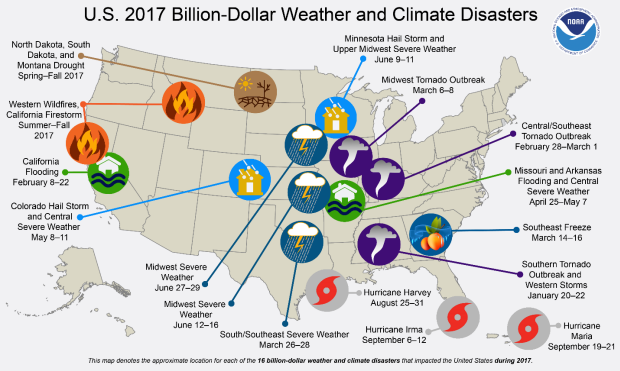 2017 ties 2011 for the highest number of billion-dollar disasters for a single year. 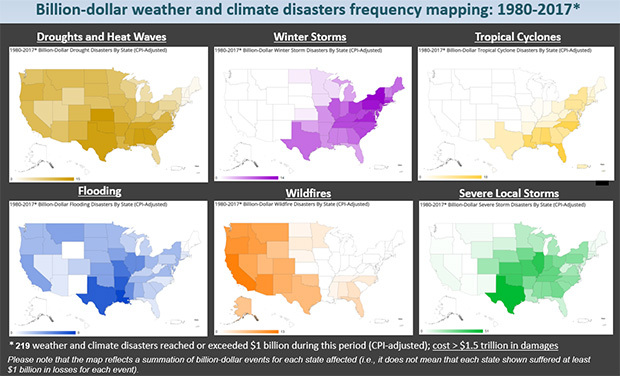 2017 arguably has more events than 2011 given that our analysis traditionally counts all U.S. billion-dollar wildfires, as regional-scale, seasonal events, not as multiple isolated events. 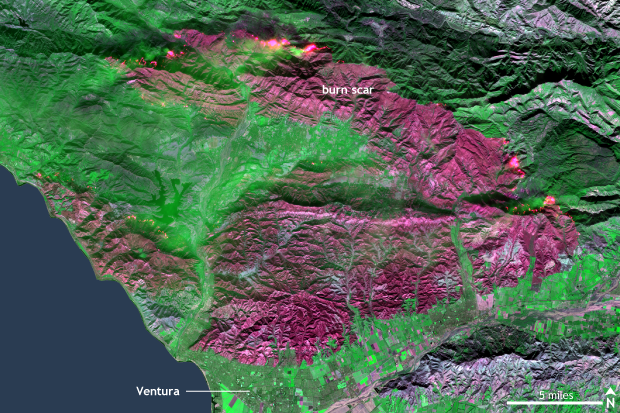 In 2017, the U.S. experienced several wildfire episodes that each exceeded $1 billion in losses in central and southern California (i.e., the Tubbs, Atlas and Thomas Fires). The only other year – again, since 1980 – in which the U.S. experienced multiple, separate billion-dollar wildfires was 2003: the Cedar and Old Fires, also in California. 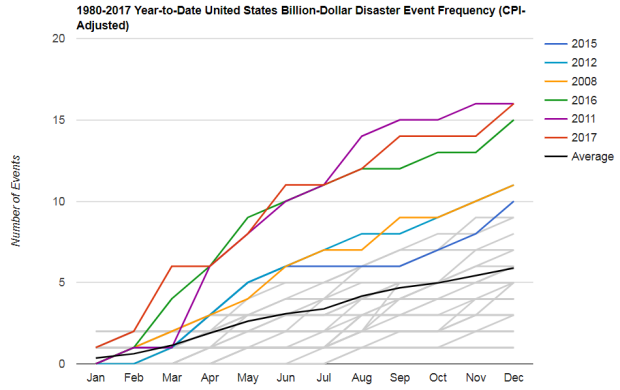 This graphic, sometimes called a “Haywood Plot” shows the month-by-month accumulation of billion dollar disasters for each year on record. 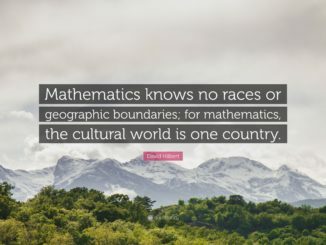 The value for a given year for a given month shows the total number of billion-dollar events that had occurred by that month. Note that there is considerable overlap, and some years’ traces are obscured. 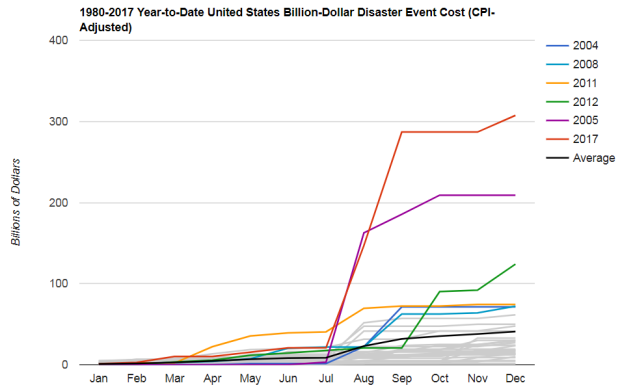 Perhaps more notably than the high frequency of these events is the cumulative cost, which exceeds $300 billion in 2017 – a new U.S. annual record (Munich Re 2016; Swiss Re 2016;NOAA 2017). 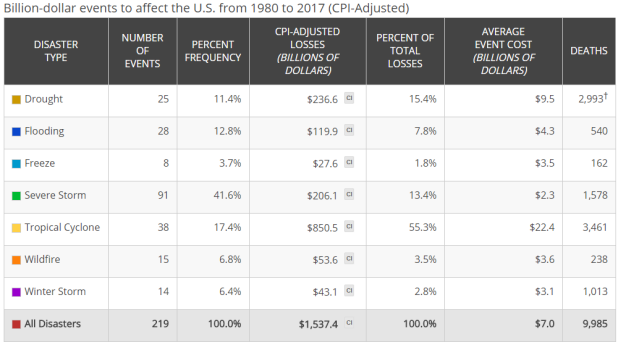 The cumulative damage of these events is $306.2 billion, which shattered the previous U.S. annual record cost of $214.8 billion (CPI-adjusted) in 2005 due to the impacts of Hurricanes Dennis, Katrina, Rita and Wilma. The damage from Hurricanes Harvey, Irma and Maria alone are responsible for approximately $265.0 billion of the $306.2 billion (NOAA 2017). 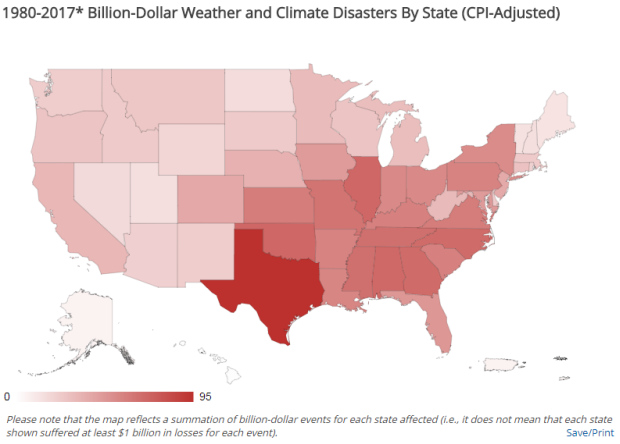 Each of these destructive hurricanes now joins Katrina and Sandy, in the new top 5 costliest U.S. hurricanes on record. In late-August, Hurricane Harvey caused unprecedented amounts of rainfall (up to 60 inches) over Houston one of America’s largest cities. Harvey is the closest modern disaster comparison we have in relation to Katrina in terms of damage costs. Harvey’s costs exceed $125 billion, only second to Hurricane Katrina’s level of damage. Harvey was a category 4 hurricane making landfall near Rockport, Texas and causing widespread damage. Harvey’s devastation was most pronounced due to the large region of extreme rainfall producing historic flooding across Houston and surrounding areas. 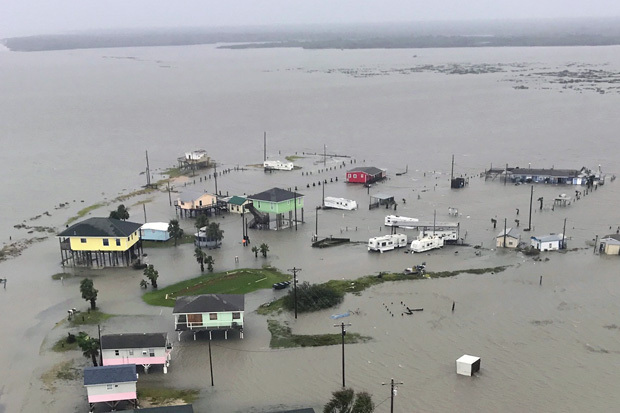 More than 30 inches of rainfall fell on 6.9 million people, while 1.25 million experienced over 45 inches and 11,000 had over 50 inches, based on 7-day rainfall totals ending August 31. This historic U.S. rainfall caused massive flooding that displaced over 30,000 people and damaged or destroyed over 200,000 homes and businesses. 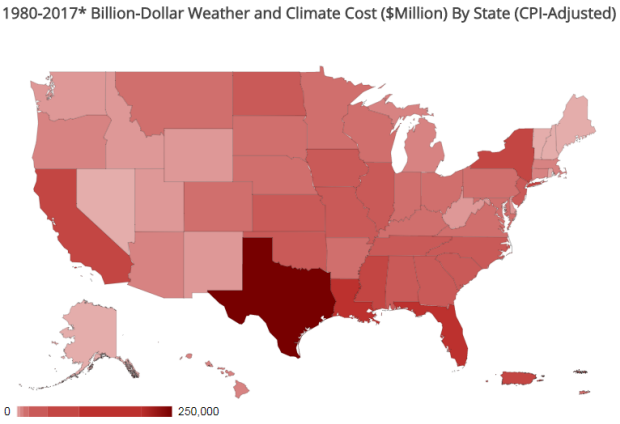 The costs for Harvey are approximately $125 billion, only second to Hurricane Katrina ($160 billion, after inflation adjustment to 2017 dollars). In early September, Hurricane Irma devastated the Florida Keys with its high winds and storm surge, after flattening the U.S. Virgin Islands – St John and St Thomas – among other Caribbean islands. Irma was another category 4 hurricane when it made landfall at Cudjoe Key, Florida after devastating the U.S. Virgin Islands – St John and St Thomas – as a category 5 storm. The Florida Keys were heavily impacted, as 25% of buildings were destroyed while 65% were significantly damaged. Severe wind and storm surge damage also occurred along the coasts of Florida and South Carolina. Jacksonville, FL and Charleston, SC received near-historic levels of storm surge causing significant coastal flooding. Irma maintained a maximum sustained wind of 185 mph for 37 hours, the longest in the satellite era. Irma also was a category 5 storm for longer than all other Atlantic hurricanes except Ivan in 2004. The costs for Irma are approximately $50 billion, which excludes additional severe damage to non-US territories. In mid-September, Hurricane Maria barreled through the southern Caribbean on a path toward Puerto Rico. Maria was comparable to Irma in its maximum wind damage, but also similar to Harvey in the feet of rain it dumped across Puerto Rico. Maria made landfall in southeastern Puerto Rico as a category 4 hurricane, after striking the U.S. Virgin Island of St. Croix. Maria’s extreme winds caused widespread devastation to Puerto Rico’s transportation, agriculture, communication and energy infrastructure. This damage was made more severe by the tremendous rainfall up to 37 inches, which caused widespread flooding and mudslides across the island. The interruption to commerce and standard living conditions will be the case for years, as much of Puerto Rico’s infrastructure has to be entirely rebuilt. Maria tied Hurricane Wilma (2005) for the most rapid intensification, strengthening from tropical depression to a category 5 storm in 54 hours. Maria’s landfall at Category 4 strength gives the U.S. a record three Category 4+ landfalls this year (Maria, Harvey, and Irma). The costs for Maria are approximately $90 billion.